Paint yourself pretty! Poise with pleasure on the primrose path carrying this playful handbag by Moschino Cheap and Chic™. 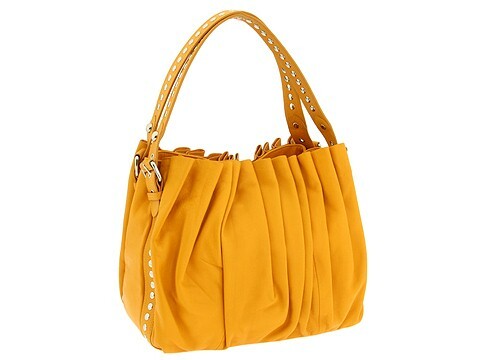 Tote style shoulder bag made of gorgeous gathered leather. Holds your wallet, lipstick, sunglasses, personal technology and a copy of your favorite magazine. Dimensions: 14 wide across bottom, 13 wide across center, 12 wide across top x 9 deep x 12 high. Dual shoulder straps. Shoulder drop: 9 length. Studded accents. Platform bottom. Top zip and snap closure. Interior lining with a back wall zip pocket and multifunctional slip pockets. Dust bag included. Made in Italy.